I learned a lot in 2011 and while I am grateful for those lessons, I am welcoming 2012 with open arms. It’s nice to have a new year and a fresh start, isn’t it? In 2011, I learned the true meaning of trust, friendship, courage, and the importance of picking yourself up off the ground after falling flat on your face. It taught me that you can have everything in the world, but if you don’t have your health, none of it means a damn thing. I learned that sometimes we can be harder on ourselves than anyone else is on us. I haven’t quite learned to truly let go—of the things I cannot control, of the pain resulting from failures, of the things about myself and others that drive me nuts, but I am working on it and will continue to do so in 2012. I want to learn to live in the present and not overanalyze the past of agonize over the future. I’m sure it’s easier said than done, but I plan to give it my best shot! No matter what your resolutions may be for 2012, I hope that you are able to accomplish them. Thank you for another year of friendship, readership, and support. You all inspire me beyond measure and I can only hope to inspire you if even in the slightest way. I wish you all the best this year! Great quotes! Without failures, we wouldn't grow. I wish you all the best in 2012 and thanks for such an inspiring blog! Happy new year Paloma! You've gathered up the best of quotes, really inspirational! Great post - Happy New Year Paloma! I too am looking forward to 2012! Happy New Year! I hope to accomplish my resolutions for 2012 too! Love these quotes! Thanks so much for posting them! Happy 2012! Wonderful post, thank you for your honesty! Cheers to a fantastic 2012. LOVED this post. So true and inspiring. Happy New Year! What inspiration! Thank you for this beautiful post. I am going to bookmark this and check back often for the extra 'love' that I might need coming in 2012. Happy New Year to you and thank you again for sharing! Check out my 30-Day New Year's Resolution Challenge on my blog. These are great. Just a small pet peeve is the Gandhi sign. His name is misspelled! 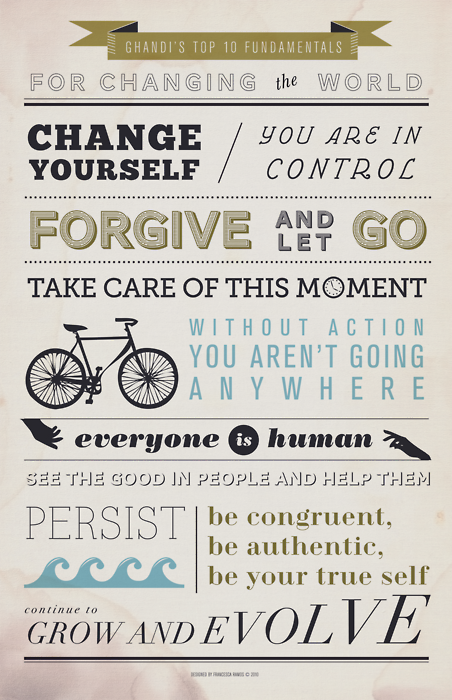 wonderful quote and resolutions. Wishing you a wonderful new year! My favourite being "I'm an idealist. I don't know where I'm going but I'm on my way'. Such a great way to think of 2012. I always enjoy your blog...thanks for sharing inspiring thoughts for the new year. I relate to what a daunting feeling it can be to pick yourself up and begin again...I love that saying, "Failure forward to success.". It really is the only way..willingness to try something new. Best wishes for 2012. Thanks Paloma for such an inspiring start for the new year. You blog was one of the first that I followed and one that continues to inspire me. I know that you will achieve all that you desire in 2012 and I wish you nothing but success and happiness! What a great post. Thank you for these words of encouragement as we enter this new year. Just what I needed today! Great Post! Definitely hoping to follow Kate Spade's quotes. I hope you had a wonderful New Year. Thanks for everything. I love the quotes you picked for your new year's post! Thanks for the inspiration! Best wishes for an inspiring, happy, healthy, fabulous 2012, Paloma! I love all of the quotes/ images. Thanks for sharing them. i just randomly came across this quote that i designed (on pinterest) "cross the ocean". Oh Mandy, that is so cool! I love it!